The stunning new romantic suspense novel from best-selling author Nicole Hurley-Moore. 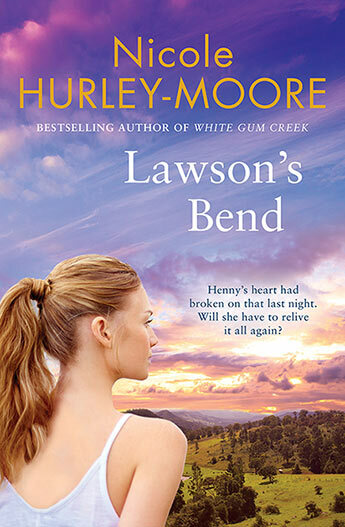 For a long time Lawson's Bend had held little for Henny. Almost ten years ago she'd got out and vowed never to come back. But sometimes things change . . . In the hot summer of 2008, Henny Bolton loses her best friend on a night they should have been celebrating their futures. It's a loss about which she remains grief-stricken. Right after the accident, Henny flees the small country town and true to her word, she's not been back. Stephen Drake never left Lawson's Bend. He once had ambitions for a different life but staying close to family became more important after that tragic night. But when Henny's mother dies suddenly in a fall near the old quarry, and Henny is forced to return to Lawson's Bend, it's apparent that questions need to be asked. Was it really an accident? Her plan was to get out of town again as quickly as possible. But then there is Stephen . . .
Nicole Hurley-Moore grew up in Melbourne and has travelled extensively, whilst living her life through the romance of books. Her first passion in life has always been her family, but since doing her BA Honours in Medieval Literature, she has devoted her time to writing historical romance. Nicole is a full time writer who lives in the Central Highlands of Victoria with her family, where they live in the peaceful surrounds of a semi-rural town. She is the author of the immensely popular novels McKellan's Run, Hartley's Grange, Country Roads and White Gum Creek.